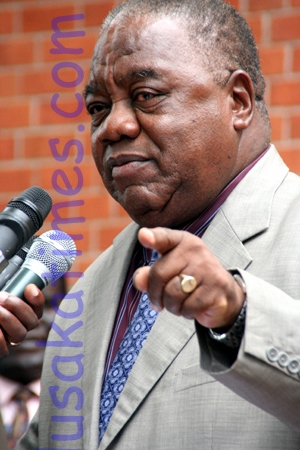 It is now common knowledge that Rupiah Banda, President of Zambia, and his MMD party have lost direction. At a defining moment in our country’s economic situation, Rupiah’s government has vigorously engaged in a fight with a private business. We can all see that the methods being used to champion the prosecution of Post newspaper editor, Fred M’membe and Mutembo Nchito are borne out of vindictiveness. It is clear for all to see that Rupiah is engaging in an eye for an eye type of politics. Rupiah is ignoring advice from all corners of moral society to focus his energy on improving the lives of the suffering Zambians. He is aggressively pursuing a path of destruction and wants to destroy anything and everything in his path. This path will lead him to self-destruction. But we don’t care if he self-destructs. We care about the millions of Zambians who have placed their hopes of an improved economy on the government. We are not interested in Rupiah settling scores with private citizens. We want you, Rupiah Banda, to bring forth tangible economic ideas which will mitigate for the diseased economy our country finds herself. We want you, Mr. President, to champion an economic program that will reverse the numerous job losses, the closings of mining companies, and the suffering of the people. Mr. President, you are the custodian of our hopes and you will need to deliver us out of this malaise. Zambians are not interested in your agenda to bring to book failing private companies. If these individuals have committed financial crimes, we have capable law enforcement agencies to deal with this. Why should it be your pre-occupation to make sure that the Post closes down. It appears, Mr. President, you have not learned from what Chiluba and other former leaders are going through today. Just to remind you, Omar Al- Bashir, President of Sudan, has been convicted at the UN for crimes against humanity. This is a leader who has abused his authority, an authority bestowed on him by the good people of Sudan through their resolve to have a ‘supreme law of the land’, the Constitution. Mr. President, it is time that you rearranged your priorities and took on a leadership role in the economy. We cannot afford another year with this kind of immaturity at State House. While you and your children go to bed on fully fed stomachs, we the patriotic Zambians go hungry. While you enjoy world class health facilities, we the patriotic Zambians are treated to mediocrity. While you still have a job because of us, we the ever patriotic people are jobless. We, the people of this great country, have made numerous sacrifices since independence, so that we may have better lives for ourselves and our children. But the rate at which our country is going, both politically and economically, one wonders what will be left of our country by the end of your term. If you have failed to run the country, Mr. President, please do the honorable thing-RESIGN. We will hold you in higher esteem if you took this step. We realize that the world has moved at an alarmingly fast pace since you lost your Munali seat in 1991. The ideas of today may just be too much for you to comprehend. Now is a time for our country to be governed by someone who understands the current economic dynamics. We need an intelligent and practical player who can steer the economic ship to prosperous shores in the midst of catastrophic storms and waves. We need someone with fresh ideas to create a unity of purpose in our politics. We need a President who will change the political landscape to that which is tolerant of divergent views, one which views political opponents as positive contributors to the well being of our nation. Mr. President, no one holds a monopoly on intelligent ideas. This is the more reason why tolerance of divergent views is critical if we have to live up to the promises of our constitution. We will not ask, or expect you to do things beyond your capability, but we ask you to consider ideas and opinions of other people. Rupiah, you are not an island of knowledge. You are not the only President this country has had. We implore you to reflect hard, magnify, and ponder. Lets see how it will be sorted out. Fellow blogers… Unless sanity vanquishes hubris, RB won’t buckle and his taking down the country with himself. The measure of a man is determined not by the road he travels but by the choices he makes along that road. In this instance RB seems to be walking those goddamn roads and making no choices except planning to shut down th post and eliminating dissenting voices. The man needs intensive reprogramming from the UNIP era! THE POST WAS HOUNDING RUPIA LONG BEFORE MMD MADE HIM A CANDIDATE. NO PRESIDENT OF ZAMBIA HAS BEEN AS PATIENT AS RUPIA OVER THE ISSUE OF THE POST NEWSPAPERS AND MEEMBE WHO HAVE UNDERTAKEN TO BRING RUPIA DOWN. THE GLOBAL ECONOMIC CRISIS IS NOT RUPIA’S CREATION AND IN MANY WAYS IT IS TO HIS CREDIT THAT THE IMPACT OF THE CRISIS HAS BEEN MODERATED. I AM BEMBS SPEAKING AND I AM ASHAMED THAT BEMBA PEOPLE HAVE SIDED WITH A POLITICAL ASSASSIN (MEEMBE AND THE POST AND WE HAVE GIVEN THEM SUPPORT FOR REASONS I CAN HAEDLY UNDERSTAND) RUPIA HAS BEEN IN OFFICE 5 MONTHS AND WE STIR UP SO MUCH HATRED IN 5 MONTHS – FOR WHAT? Ba Nkole, let me remind you that Obama has been president for 6 weeks and he has already given the American people reasons why he should be president. RB on the other hand has been presedent for 5 months and the Zambian people have heard nothing , but fighting with the post and his ministers. Please tell RB that he is bigger than the post newspaper and should concetrate on developing the country. Nkole… No one is siding with anyone. In as much as the president has made it clear that he will personally see the post shut down, doesn’t it bother you that in no uncertain terms has he not elaborated the way out. I mean we all know this is a global problem but RB seems to be so clear with the inconsequential than with substance and that is reason enough for so much dissent of RB by the citizenry. In those five months he should have laid out the blue print for Zambias recovery all his said so far is that his got sharper incisors to sink into his dissentors. Conclusively, this Chanda C is not only incoherently childish, irrational, unresearched but a poorly schooled smithwording critic coached to justify prosecutable impunity. Development is not seperable from corrective measures against acts of economic sabotage.Development is not only driven on preventative and tracebility measures but correctiveness too fthat oster investment confidence.How can an administration overlook acts of economic sabotage when its the castodian of rule of law and national interest? Aren’t ZRA, NAPSA, ZSIC, ZDB AND NAC all public institution subjected to bleeding at the hands of racketeering and latcheting state institutions under Government jurisdictions? Obama is just a celebrity which is why people have sided with him. Black people feel they have made history and white people just don’t want to look racist which is why Obama gets so much support from the public. Tell me, how is hyper-inflation going to fix the global economy?? Obama seems to have read a good chapter from Gondo’s guide to Gonomics. Zambia as a nation has no time for reprogramming a president naiwe nyangu. All Banda needs to do is prove to the zambians that he is the best person to be the president and stop dwelling on petty issues such as fighting a newspaper. Banda has a big responsibility of rejuvenating the economy, fighting Aids which is wiping out the nation and fighting corruption. We can do better than the current obtaining situation in our nation. BA NKOLE KABIYENIFYE [email protected] NGA NMWISULA @[email protected] ATEMWA TAMWAIMBA ICIMBUSU KUNUMA YANGANDA YENU MUYA KUNUMA YA CULU. Stunningly some of you diving in confusion on the ZA saga are evidently unsophisticated for concealed white collar crime. Anyone who has done financial due deligency, loan underwriting and risk management would not fail to see the cartel, racketeering, latcheting and cover ups in the ZA.If i may ask, Where does NAPSA,ZISC all state institutions under the Finance and local Government ministerial mandate come in a private entreprise in liquidity mess with zero security to be lamped up with more hard currency loans? Is this a practice in Government GAZZETTE? In the face of a loss, who takes the liability? If that becomes a practice in public institutions, should i go borrow same amount from ZESCO or any such public institution like ZRA then blow it up without repercusion? will you kiss it call me a hero? What will stop those connected from doing this when you say its normal? Should patronage take this route? How did ZDB a ministry of Finance regulated State Development Bank daily filling its activities with MoF come up with a US $6million loan package for a riskier company then buy the idea from Mmembe to cover up the loss by buying the bad loan? Even in Sweden, their bad loan good Swedish Bank miracle was never premised on such version of racketeering. I’m keen after all investigations are over and prosecutions start, i want to know where ZSIC,ZDB and NAPSA drew that mandate to risk pensioners money and premiums with a highly risky liquidity negative heavy company. Where are the Government Comptroller,Accountant General,Local Government, MoF permanent secretaries and respective institutional company secretaries (legal)to let this happen? Since when and why this breakdown and impunity in public finance principles? In whose interest where the people’s premiums risked for when LASF/NAPSA is failing to pay thousands of pensioners’ life time saving? Chimpanzee, i’m open for hot smart mind stimulating issues of public interest debate than your low grade cravings evident here.Lets discuss fundamental principles that will add value to the country than hyperboles of vanity.Kindly elevate your blogging to some universal class synomymous of an organic Generation. Well said, but unfortunately I suspect it will fall on deaf ears! Akamba yeka uyu. I agree 100% with his views yet i fail to belive that in Zed people can resign on there own over economic related failures. RB has failed lamentably. Maningi anso! We are a country free falling from the sky. Not even on auto pilot. Oh mother Zambia! Wherest thou go to?? Pa last you can become a priest!! #4.1 How feasible is your suggestion? It may work elsewhere , and it might have worked in the past , I don`t see it work in Zambia .Some of the options that can be exploited could be through the parliament . In a poverty stricken society that is regionally aligned and politically divided massive strikes becomes an obsolete strategy. UNFORTUNATELY, ZAMBIANS ARE NOT THAT BRAVE. THEY WILL WAIT TILL KINGDOM COME. THE BEST WAY TO UNSIT THIS SLEEPING PRESIDENT WITH DREAMS TO SHUT DOWN THE POST IS TO GO ON STRIKE FOR A WEEK OR SO. THE CHAP WILL HAVE NO CHOICE BUT TO TERMINATE HIS HONEYMOON. GO ZAMBIA GO. FOR HOW LONG ARE YOU ZAMBIANS GOING TO TIGHTEN YOUR COPPERBELTS WHEN RUPIA AND HIS FAMILY ARE LOOSENING THEM. WELL, LETS CONTINUE SLEEPING AS A COUNTRY. THAT IS A LIE. AND YOU KNOW IT. ZAMBIA IS EXPECTED TO POST 4.5% GDP GROWTH THIS YEAR. WHERE ISTHE FREE FALL? . STOP PARROTING MMEMMBE’S LIES. Ba Nkole , do you even understand the meaning of GDP, Where would 4.5 come from when no one is buying cooper. In 2006 when Ba Levy was in power and cooper prices up, we had growth of 3.8 in GDP and today the mines are closing you come up with 4.5 that is a big LIE. When Levy cam in we where growing at 3.8%. In 2007, we where growing at at least 5.6%. It is not surprising that we would fall back to 4.5% since the demand for copper has gone down. I hope Rupiah reads this LT. Good article LT. The country can not survive two parallel systems of governance. The manipulative efforts of some newspapers and their wish to govern by a dirty umbilical extension did not just stop at politics, but clearly overspread to economic matters. We must wait patiently to see whether such papers saw a line between greed and genuine journalism. I’m for investigative journalism, not innuendos, half truths cultural insensitivity by cartels governed by outright greed. I think Bwezani has ideas to clean the slate for good. Good Article, Instead of Spending time finding solutions to the peoples problem, you are busy talking about Fred Mmembe. CAN YOU IMAGINE WHAT PRE-OCCUPIES PRESIDENTS IN ZAMBIA. Ka chiluba also invested his energies in wanting to finish the post newspaper. He ended up finishing himself. Now, its Banda who already came finished. Kaunda at one time also wanted to finish ka Chiluba he also ended up finishing himself. Every president of Zambia wants to finish at least one individual and they [email protected]@lishly invest all their energies in such. Little wonder they fail. Kaunda inherited a very handsome reserve. In the name of 1 party he partied himself to reserves depletion. Well done presidents of zambia. Ba Big Ule or sorry Mule, please comment on the article at hand. Is RB your relative? There is nothing RB is doing thats why only intelligent peolpe in the MMD have realised. Zambia today is a ship with no capitain to direct. The ship is faced with storms the captain is busy kissing a young lady in the cabin. Oh Mother Zambia. This is a rare well said article. To day we have seen the re-emergence of PARTY VIGILANTIES. HE HAS TO BECAUSE, BECAUSE HE WONT BE ABLE TO WORK IF MMEMBE INCITES PEOPLE AND THEY BRING THE GOVERNMENT DOWN. MMEMBE IS NOT JUST AN INDVIDUAL. HE IS A POLITICAL ASSASIN WHO WANTS TO BRING RUPIA DOWN FOR HIS OWN PURPOSES. HE HAS FOUND FERTILE GROUNG BECAUSE ZAMBIA’S GOVERNMENTS HAVE BEEN MINORITY GOVERNMENTS. IT IS WORSE FOR RUPIA BECAUSE HIS SUPPORT IS IN THE RURAL AREAS, AND THEY CANT DEFEND HIM. NKOLE you should research before you post any comment. You are saying that he has support in rural areas in the same areas where human beings are eating wild roots. If you had a human heart, u would NOT be happy when u hear that people have resorted to eating roots. Shutting down the post will not make him a wiser person nor will that solve the country’s economic chaos. He is not the first or last to be hounded by the press. The president and all his supporters are using the post as a scapegoat to hide their failures. #8.1 Mockery is not a virtue . Please do not mock the humble quietly suffering rural folks . If at all RB has support from the rural areas ,then he is truly an ingratitude , selfish individual . How many rural provinces has he visited so far after his ascension to power ? I can say with confidence that he has not visited western province and he may not do so in the nearest future .He got some of his votes from shangombo now cut off from the rest of the country . I am sure the people there, are praising him as they swim in water, with out emergency boats. I have never heard RB categorically state the path to prosperity of our country. His preoccupation currently is to purge the MMD, expel all those he considers a threat to his bid for the 2nd term. We can not have some one in State house being controlled by chaps from Kulima Tower or KMB, God help us please. PRESS CLIPPING: Asked by the BBC on what measures the Govt would take in addressing the economic difficulties facing the country, and the problems within the MMD, President Banda replied, “I don’t know. But i would like to thank the people of Zambia for electing me as their President. I will ensure that the Legacy lives on”. Reporter: What legacy your Excellency? Am just trying to illustrate how RB has no direction or sense of it. We are in big trouble bane. If you listen carefully, “I don’t know”, is his favourite phrase! BBC and others do not know that the villagers voted for him, unfortunately he is embarrassing all of us. Why are people so dismissive of villagers? Are they not fellow citizens? In one breath we put them down and in another we cry crocodile tears saying ‘they are eating roots’. What kind of country and democracy are we going to create if we look down on our fellow human beings simply because they are ‘villagers’? Nothing wrong with villagers but the problem with most of them is that they will vote for someone for a packet of sugar. That packet of sugar does not equal 5 years! WRITTEN BY MMEMBE…..HE IS SO SCARED OF GOING TO JAIL AFTER COMMITTING ECONOMIC CRIMES. Are you RBs relative? Then we understand your warped sense of justice. My friend, you would be surprised to find that a large percentage of people actually support Fred Mmembe because he is on the right side of the argument. RB is corrupt and petty, that is why there is no development going on in Zambia right now. If this guy is allowed to continue after 2011, Zambia will become one of those so-called “failed states” which never come out of their problems, like Somalia and Afghanistan. Our hope is to have Mmembe exposing these crooks in government everyday until the citizens get angry and demand an accounting. lt is becoming an extension of the post……Hope its not Fred the criminal posting his useless thinking on this blog. Just prepare to defend yourself on the upcoming cases…..ask chiluba and chungu. No running away from economic crimes…. During campains questions were asked how RB was going to reduce the price of mealie meal in the face of world reccession; answer was this did not affect Zambia. But today after “winning” the election world reccession has “affected” Zambia. THINGS MEN DO never stop to amaze me!!! Up until recently many countries thought that they would not be affected by the current global meltdown. China thought it would be immune as did many non anglo-saxon Western countries. You can not blame Banda on what is going on in the world. Mmembe was against Banda from the start. I think part of the problem is simply because Mmembe and his supporters are not happy with an Easterner heading the country. There is no merit in what you have just said. #!13.1 There you go . As a westerner Please give us an Easterner like Muhabi Lungu with grey matter not a dementing person not his fault though , for a president . Times like these requires a true dedicated Moses , very focused , pragmatic and visionary to salvage the deplorable Zambian economical situation . RB has failed , let it be on record. RB if you can not stand for something, you will fall for anything. Please restrict the precious time given to you by the people, to address matters that will help us come out of this economic crunch. Time is money and it surely is the tax payers money that is gong to waste. Our leaders just never learn. They behave like their own cadres running the streets as if development comes from being talkative. Zambia needs a leader with less words and more action. Show the people that you as a leader have the power to change the lives of many and not just sacking your ministers whenever they criticize you. President Banda, do both, work hard to improve the economy and at the same time bring to book the said culprits. It is really a shame that we the educated would rather sit and wait for RB to focus on development. If RB had any leadership qualities at all he would not need us to write letters begging him to focus on development. We just need to look at reality right now, 2 more years of this nonsense will put all of us in the grave, RB has to be removed on behalf of the poor, hungry dying people in Zambia. some one please tell me why today’s Post newspaper has not been published today? My question as well! Whats happening? Its been printed. Was just late due to “technical hitch”. As an on line copy is there. Since you are physically in the banana republic of Zambia, you might as well enlighten us . Fred Membe has bought off LT. its a good move i hope he is not taking LT down with him. LT please we need you as a platform for divergent views but today you have decided to pass judgement and declared which side you are. Is it a coincidence that almost all articles that have declared RB a total failure from the day he took office are written by people with Bemba names. even pastors denouncing the Govnt have Bemba names and RB lost in all Bemba speaking Areas. please lets stop preaching doctrines of hate the election is in 2011 this guys have projected a 4.5% growth why dont we wait and see? Engines, my friend. By divergent views you mean that LT should be anti-Mmembe? What a poor mission that would be for a news organization. Boyi, LT has a right and a duty to publish both sides of an argument. They have so far given us predominantly RB-biased articles, so this is a good countervailing force to balance the coverage of the issue. RB is not a god for us not to criticize. And, the article was well written and well reasoned in my opinion. Why don’t you just rebuff the arguments presented instead of quickly becoming an irrelevant tribalist? Impressive tribal issue. Zambia is surely bigger than any one tribal or regional grouping. 2011 elections are nearing and nearing seriously. I am hoping there will be no tribalism by then on LT and in the whole of Zambia. Vote the U-Team for Zambia in 2011. To be frank,its evident when a government has brains to steer citizens out of the credit crunch.As the earlier blogger stated,Obama has been in office less than 4 months and the brother’s efforts are been seen.The in thing on the global platform for those prevelaged to have leaders they voted for as president is resurgence of local companies and protecting pipo from employment loss.This is no time for championing the MMD legacy at the expense of the evident majority that would never want to be associated with this party…I hope we shall be more vigilant in next elections. The president has indicated before that the economic melt down is beyond zambian govt’s control and will just have to pray to God that he delivers zambia, the zambian people will just have to work hard and improve their living conditions, produce more food to feed themselves……… (ZNBC, RB talks capture at Lsk Int’nal airport with J. Kufo former Ganaian President).I think we need more of hopeful talking from our leaders than anything else. No one knows whether Obama will succede in what he is preaching abt but he speaks with vision, hope and conviction. Our leaders need to give us hope. it hurts to lose yo job today and yo leader says its beyond him and has no solution for you. You must be MMD, Mr. I dont see any sense in what you’re talking about. Your language does not connect well. What are you talking about? Hmm. We are not saying the government cannot probe ministers or corporations when they are wrong but he needs to do so a different route. All he has been doing is making noise “showing us people that he is working” rather than talking about the real issues. What right does he have to close down a paper if he does not agree with what they are saying. I thought we have freedom of speech. if he finds it a problem let him sue for defamation not threaten closures. NKOLE there is nothing to defend. for the first time in 17 years people are whipped for mealie meal. NKOLE, if you are a real Zambian and you are in Zambia, it should be in you mind that Zambia has REALLY GONE DOWN. People are suffering the President is busy fighting individuals. In your RIGHT FRAME OF MIND DO YOU REALLY THINK IT SHOULD TAKE THE ENTIRE PRESIDENT OF A NATION AND HIS MINISTERS TO FIGHT AN INDIVIDUAL????? NKOLE you should research before you post any comment. You are saying that he has support in rural areas in the same areas where human beings are eating wild roots. If you had a human heart, u would NOT be happy when u hear that people have resorted to eating roots. Mmembe is inciting hatred and divisions. Banda was given a huge mandate by the MMD to become their candidate. Magande lost by a large margin. You can not divorce what is happening in the world with what is going on at home. If anything, you should blame Mwanawasa for what is happening now because perhaps he did not do enough to diversify the economy from mining into other sectors whilst the going was good. Also Chiluba is responsible because the terms on which he sold off the mines were so bad that we did not benefit from the boom that has just ended. I feel that people should give Banda credit. He kept the country together when Mwanawasa was absent. We need to see what will happen next. You have brains and a thinking mind.National development is a building block consecutive administrations build on.Zambia for 17 year has been a copper heavily driven economy with no substitute sector.Macroeconomic forces at the hands of RB are uncontrollable.Our quagmire is relative to the world economic ondition.What capacity has RB inherited on to propell development? Even the Japanese, Korean, Swedish or German micracles were not realise on nothing but existing foundations.There are copperbelt councils 6 months long a recession, the mines are outnd councils have no revenue.BOZ has no source of refueling the economy with hard currency.Any administration will struggle for survival. In the absence of economic foundation following failures of the supply side IMF policies, Development in Zambia no matter how ambitious administrations may be will be realised in more gradual way than wished.We may diverstify, involve more locals in the economy and foster quality investment, but gains will not be overnight. Its sad to note that a senior citizen like you is unable to see what is happening in the current leadership or is it that you are part of the MMD leadership itself that you fail to reason independently. For goodness sake, try to have independent line of thoughts. Can you prove that in a court of law. And if you can how come the president with an army of legal adviser can not sue the paper? #28 Let the care taker President ,honorably and with air of dignity pass on the mantle of leadership to some one come 2011. Credit should go to Zambians for being peaceful not RB during the tragedy loss of LPM. RB with all the state machinery on his side ,why be scared by the post editor . 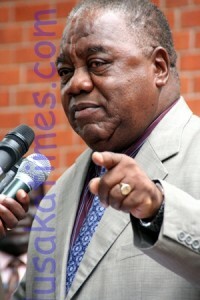 Zambians do not need an infant old man for a President we need thick skinned person. I understand that people from Mbala live on green leaves and beans! What good can come from Mbala boy? hoplessness again. My personal impressions are that President RB Banda is on course although I do not agree with the way he has done a lot of things. If he were to offer me a Ministerial job, I would certainly refuse to work under him because of obvious reasons. In short, I can only work as a Civil Servant in his MMD GRZ and not on a politically appointed job by him. Maestro, there you go again, the saying is ‘birds of the same feathers flock together’. I though you said you were educated. What is tour exact problem with my comment? The saying goes both ways “Birds of the same feathers fly and flock together”. No need to argue where there’s no arguement. why argue about english which is even not your mother tongue? one can use another word in place of another. That’s the beauty of language. Discuss the issue at hand. The correct saying is birds of a feather flock together or you can simply say birds of a feather. MMD and RB lost direction? That is if they had any direction at all to begin with. I don’t know about the person who wrote this article but from what I see, Zambia economically is still head towards the right direction amidst the financial crisis. We are seeing more sectors in the economy being invested in other than mining. Also on the issue the author brought up about RB not welcoming other views is very ignorant. Just a few days ago, we where reading about how RB met with HH to discuss the many issues in Zambia regarding the NCC, the economy, etc. RB has always welcomed Sata and has always told him that he is willing to work with him on the challenges Zambia is facing and yet Sata has always refused to meet with RB. I think in all this, you are mixing up constructive criticism and insults directed at the head of state. RB like any normal human being can accept constructive criticism (key word constructive). If you want to read insults directed at the head of state, just check the caliber of certain comments directed at the seating head of state by a few individuals right here on LT like Baby C, JIGGA, Ba Dr Maureen, Ghost Dog, Dark Knight, etc. From comments like the ones these individuals make (even going as far as insulting his wife), you can see why certain criticisms which you think are constructive are not taken because they are filled with hate and insults. Just to remind a month ago, you supported a statement by World Bank representative that the Zambian economy is going to grow more than last years record. Do you still hold the same view especially that the economy is almost in a state of collapse ( the government is not able to control the micro economic dynamics ) and they are calling on the IMF to provide Stand By portifolios to balancce the deficit . This is exactly what I expected and explained. Im fine, how are you. Well I think I supported the world bank on that statement before the Financial Crisis happened. I do not hold that view because the copper prices have fallen and that was a major driver of our economy. It is true that govt cannot control micro-economic dynamics but they can control macro-economic dynamics so as to influence micro-economic behavior for the desired outcome. I don’t see anything wrong with calling the IMF. If there is any wrong in this, please state this as I do not see anything wrong with it. I forgot to add that we also have the economic zones which are aimed at manufacturing and agro-processing. Anyone can take part in these zones. The economy this year like many economies around the world will not grow as much as last year due to external factors. You are spot on with your sincere observation.But be informed that i personally know some of these kids cyberstalking leaders and fellow bloggers one being Jigga.He is a kawaya waya irrational wrecked kid without a life purpose but obsession for insulting leaders.Time will tell how life space will serve him along on his fantasy trail. Nkole Fimofimo The bembas are not siding with M’embe and other individuals attacking RB. All what we are firmly stating is that the nation should not be enganged in the personal battles between RB and the Post ,ignoring the real economic problems the country is facing. The author is triying to make this point clear, we cannot be shadowed by these battles but rather look at the economic failures and achivements of our current government. Of course we are very much worried when we see the MMD failing to deal with internal problems which enventually translates into the current poor state of governance . Much as I welcome the critique against RB’s rough style of leadership, I think we also need to draw a thick margin between the economic problems that RB is able to solve and those that are dependant on the recovery of the global economy. There is not a single country on the planet that is not experiencing economic malaise at the momment and ofcourse the easiest thing one can do is to blame the leaders. Ba Chale. You may be right. But, go to Botswana and Namibia and see how they are experiencing it. Those are even supposed to be hard hit as they are not a cash-oriented economy and most of their populations have morgadges. In Zambia people use cash. Thanks JJ. But the fight with the Post should not be the President’s priority number one. We have enough Law enforcers to do the job. Becuase he is out to defend his image, the president has lost direction. If he is a man of Vision and Direction the barking dogs would not divert his caravan. With vision you march on no matter what. on informing and educating the general public. Mmembe should try to be honest and give credit where its due. (4) All in all, I understand that the nation is facing the Global recession but its the role of the current Govt to come up with a plan (short or long term) on how to solve the problems involved. We need plans such as small scale agricultural schemes using irrigation systems and many more. Its my prayer that a plan will be found and hope RB will change his leadership style which brings party cadres into Govt decision making roles. Well said chanda, Rupia has exhibited the worsk kind of leadership in zambia. He has an uncontrolled rhetoric which is very much uncalled for . Ruoiah has to keeo self out of some issues and focus on the current economic situation, we have courts to address some of these issues, thus its not his duty nor province to deep his hands in unnecessary rhertoric. CONCLUSIVELY, CHANDA KEEP IT UP. ONE OF THE BEST STORIES ON THIS BLOG. LT, THANKS FOR FEATURING CHANDA’S STORY AND KEEP IT UP, TOO. Wow. I have only read halfway and I applaud Lusaka Times for writing this article. funny enough I have been talking about this with other zambians here and it is great to see that we are thinking the same. Who cares what the post, have or have not done. Eye for an eye, you are darn right! His focus should be our economy gosh!!!! Shall I finish reading the rest. I have finished reading. *clapping hands*. I will forward this to everyone I know. Our President lives in a bubble. I was home for the december holidays, had left in 2007. It was the greatest feeling to be home for the 1st week or so, then I went into anger and sadness to see that nothing had changed. What plan does he have? What is his agenda? Economy is what drives the country forward, has he done anything? created employment? put policies that are beneficial to the country as a whole? Everything is so slow, it is sad. The funniest thing would be if he started talking about this article. Disgraceful is what it is.